If you shop with a tight budget, and only go once or twice a month to the store, there are inevitably going to be times when the larder is becoming bare and still it isn’t Grocery Day. With experience, these times become a day or two at most, but it is always nice to have someone up the proverbial apron sleeve, to make a meal feel special, without a lot of extras that you may be out of. 4-6 cups chopped rhubarb-measured loosely, it doesn’t matter as long as your baking pan is 1 inch full of pieces. In a baking pan (I use 9X 13 inch cake pan) add the rhubarb. I like to do this with frozen rhubarb, partially thawed. The rhubarb will be juicy as it thaws. Break it up, so it evenly covers the pan. Sprinkle sugars/jello powder/flour/oats over all. Place pats of butter evenly over the entire pan. Bake 375 for 30-45 minutes, or until hot in the center and topping is slightly browned and bubbling on the edges. Serve over ice cream or with whipped cream. Delish!! 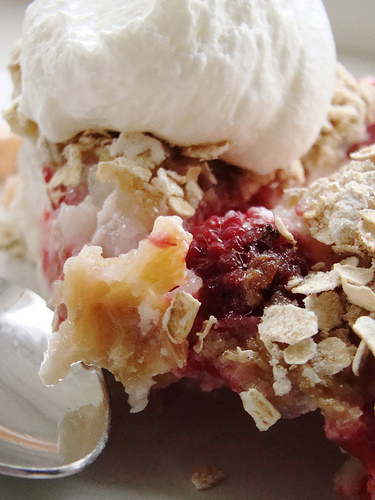 This recipe is one that has been calling to me from one of the cookbooks I have in my stash. It seems so simple, yet interesting enough to make dinner seem a little bit special. To make them, slice as thinly as possible, but leave the bottom intact, so you can fan out the slices. Add a bit of butter or olive oil to each potato ( in this case, I used 1/4 stick of butter for 7 potatoes), and applied it with a basting brush. Sprinkle with sea salt/seasonings and bake in a 450 degree oven for 1 hour. 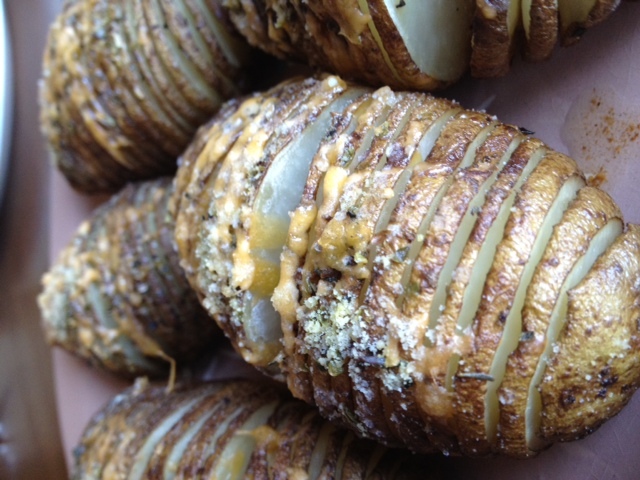 Then remove from the oven and shred just a bit of cheese onto each potato. Pop back into the oven for about 5 minutes to melt the cheese. Sundays are donut days. 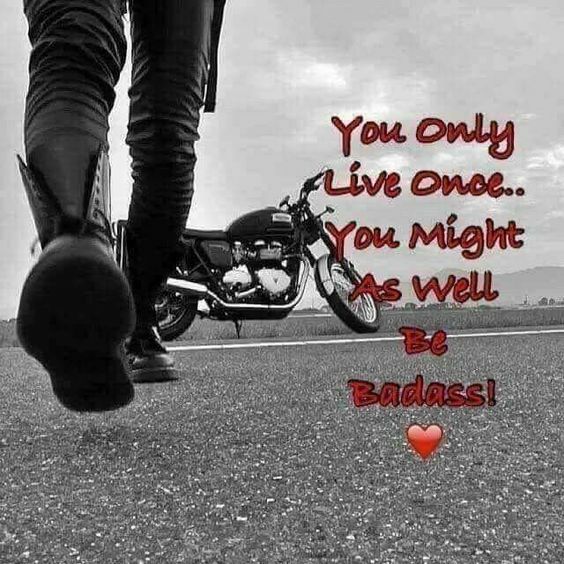 We usually try to take things a little bit easy on Sundays, and I try to make us all a treat. Donuts are easy to do and well loved by everyone in the family. Although we are from back East where cake donuts are the norm, it is fun to make yeast donuts once in a while to shake things up a bit. Add yeast to warm milk, and allow it to proof (become foamy) for 5 minutes. Then add sugar and salt, stirring gently. Punch down and pat out dough into a 1/2 inch thick rectangle. 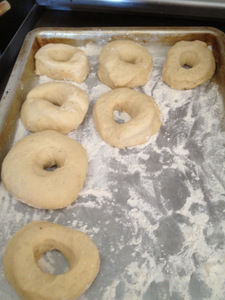 It is important to never re-roll yeast donut dough or it will be tough. 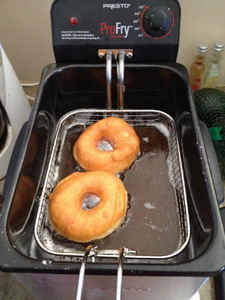 Heat your oil in a fryer to 350 degrees and gently place your donuts in. I can fit 2 but 3 donuts would be too close and they would stick. Fry for about 3 minutes or less-they should be lightly browned. Flip and fry for a minute more and remove to a rack to drain. 1/8 cup of water-use your judgement. Melt butter over medium heat, being careful not to brown it. Add sugar and stir. 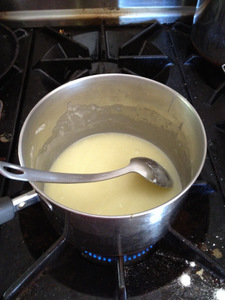 Once sugar has absorbed the butter, drizzle in some water and stir to make a thin glaze. 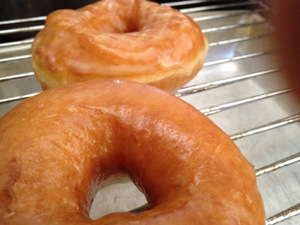 Immediately drain glazed donuts on a rack and enjoy! 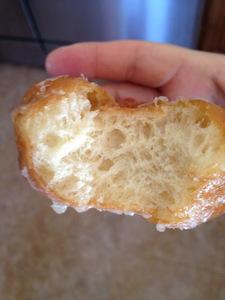 I cut out holes in some of my donuts and fry both pieces, or add no hole and fill these with jelly. Simply jab each donut with a cake decorating bag and fat tip, filled with jelly. Squeeze in a tablespoon of jelly and you are done! I glaze these on one side and serve.